This article begins our 10th year of featured catfish. Who better than Heok Hee Ng to, once again, bring the montly spotlight to bear on an Asian fish with a very large distribution indeed. 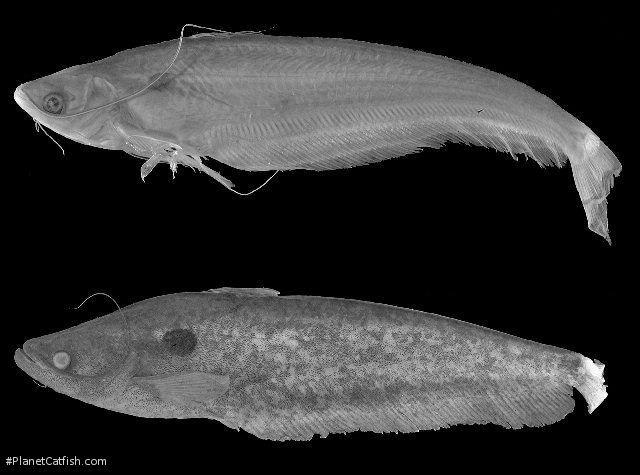 The phrase "gentle predator" sounds oxymoronic, but this precisely describes the subject of this month's article, the two spot glass catfish (Ompok bimaculatus). The "gentle" part of its name comes from the fact that the fish can be housed comfortably with like-sized tankmates, and will never bother them in any way (not even an opportunistic nip). In fact, it is somewhat shy and retiring in nature, and is usually found hiding in a crevice or amongst dense vegetation. The "predator" part of the name is made self-explanatory when one looks at the upturned mouth, which is filled with sharp teeth and is somewhat reminiscent of a smaller version of the fearsome tapah (Wallago leerii). It goes without saying that small fish are not safe as tankmates; the two spot glass cat will happily snack on them, eating them in much the same manner as the tapah would (sidling up to the fish and then lunging at it and engulfing it in its large mouth). As we currently understand, the two-spot glass cat has one of the widest distributions of all Asian catfishes (surpassed only by Bagarius yarrelli). Like B. yarrelli, the two spot glass cat consists of several species with more restricted distributions all currently lumped as one. The fish from the western (Indian) end of its distribution don't really look like those from its eastern (Southeast Asian) end. The Indian "species" (if there is only one species to be found in all of India, which is again debatable) generally have narrower heads and a silvery coloration while the Southeast Asian "species" (again, there appear to be more than one species involved) generally have wider heads and a mottled brown coloration. About the only thing the Indian and Southeast forms have in common is the presence of a distinct humeral spot (the peduncular spot, which is the other feature that gives the fish its name, is often faint and sometimes absent). Even this feature (the humeral spot) is absent in the Sri Lankan form, which are a mottled gray in color (and may represent yet another species). The two spot glass cat is a popular food fish in India (and to a lesser extent, in Southeast Asia). The flesh is considered very tasty (which has led to its other common name of butter catfish). The Southeast Asian form (for which the name Ompok siluroides Lacépéde, 1803 appears to be the oldest available) is the one more commonly encountered in the trade. This species inhabits a wide variety of habitats (ranging from hillstreams to lakes to large rivers), and is therefore tolerant of a wide variety of water conditions. Xanthic and albino varieties (at least of the Southeast Asian form) are sometimes also encountered in the trade. Etymology The etymology of Ompok is unclear. It is believed to be a corruption of the Indonesian name for mid-sized silurid catfishes, limpok. The specific epithet comes from the Latin bis meaning two, and macula, meaning spot; in reference to the presence of two dark spots in this species. The two spots are found above and behind the pectoral-fin base and the other at the base of the caudal peduncle. The fish often idebntified as O. bimaculatus (and most commonly encountered in the aquarium trade) is a Southeast Asian species, Ompok siluroides which has a rounder head and a mottled brown colouration, while O. bimaculatus are silvery and have a sharper head. Furniture Provide plenty of hiding spaces in the form of driftwood or PVC pipes. Prefers an area of open water when active. Current preferred. Breeding Not known in the aquarium. Has been bred using hormone injections in India. Jayaram, KC. 2006. The Catfishes of India. Narendera Pub. House. 383 pp. Jayaram, KC, 1977. Year of publication and type-locality of Ompok bimaculatus (Bloch) (Pisces: Siluroidea). Newsletter of the Zoological Survey of India, 3: 50-51. Burgess, W.E. 1989. An Atlas of Freshwater and Marine Catfishes; A Preliminary Survey of the Siluriformes. TFH. 784pp.